A student who attends Bennington Elementary School has been honored as one of the top two youth volunteers in Kansas. Hunter Hotaling, 18, of Lansing and Riley Padget-Cook, 11, of Minneapolis today were named Kansas’ top two youth volunteers of 2019 by The Prudential Spirit of Community Awards, a nationwide program honoring young people for outstanding acts of volunteerism. As State Honorees, Hunterand Riley each will receive $1,000, an engraved silver medallion and an all-expense-paid trip in early May to Washington, D.C., where they will join the top two honorees from each of the other states and the District of Columbia for four days of national recognition events. During the trip, 10 students will be named America’s top youth volunteers of 2019. Hunter, a senior at Lansing High School, mobilized nine of the schools he’s attended over the years to collect and contribute clothing, supplies and money for students and staff at his former elementary school, following the devastation caused by Hurricane Harvey in the Houston area in 2017. The son of two military veterans, Hunter has had to change schools frequently as his family moved from place to place, but he always had particularly fond memories of his first school, Franz Elementary in Katy, Texas. So when he learned that the school sustained significant damage during Hurricane Harvey, and that students and teachers there lost homes and belongings, Hunter sprang into action. Hunter found volunteers to sponsor individual classrooms at Franz Elementary and determine their needs, then contacted the principal at each of his former schools – plus more than 40 organizations and individuals around the world – to ask for help in collecting new clothes, school supplies and monetary donations for Franz Elementary. Within a month, Hunter was able to deliver thousands of dollars in contributions to the little school in Katy. In addition, Hunter has spearheaded numerous drives to collect cereal, diapers, hygiene products, clothing and other essentials for a variety of charities, and last winter recruited 20 classmates to give free holiday manicures to residents of a local retirement home. “Because I have the unique privilege of being able to help others in need simply because I can, I feel it is my duty to create these projects in my community,” he said. With encouragement and help from her grandmother, Riley shopped for supplies and began making slime. After a lot of trial and error and feedback from customers, she improved her product, designed a container label and started marketing through promotional videos and her grandma’s Facebook page. It quickly became so popular that Riley invited her best friend to join the business. They sought permission to sell their slime at school events, and broadened their product line to include a variety of colors and flavors. In less than two months, Riley’s business generated more than $1,500. Riley sent two-thirds to disaster victims in Florida and used the rest to promote awareness of childhood cancer, buy three collapsible wagons for cancer patients and assist a single mother with four children. The program judges also recognized four other Kansas students as Distinguished Finalists for their impressive community service activities. 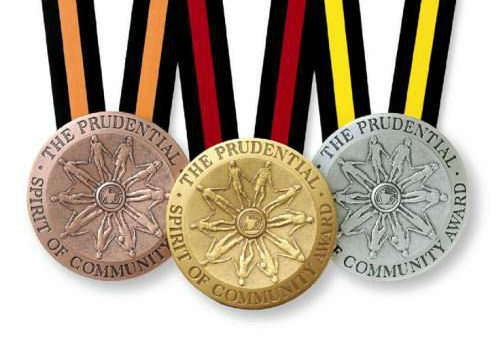 Each will receive an engraved bronze medallion. Slater Heglin, 18, of Ulysses, Kan., a senior at Ulysses High School, formed a project management team of fellow seniors at his school to raise funds to provide turkeys for local families who couldn’t afford a traditional Thanksgiving meal. In their “Tokens for Turkeys” project, the group invited students to contribute coins to select which pair of teachers at Ulysses High would swap jobs for a day. Lanya Meade, 14, of Kansas City, Kan., a freshman at Sumner Academy of Arts & Science, organized a class competition at her school to collect donations that were used to provide feminine hygiene items to girls in homeless families or transitional living facilities. She also hosted a free self-defense class at her school to teach her peers how to stay safe in dangerous situations.